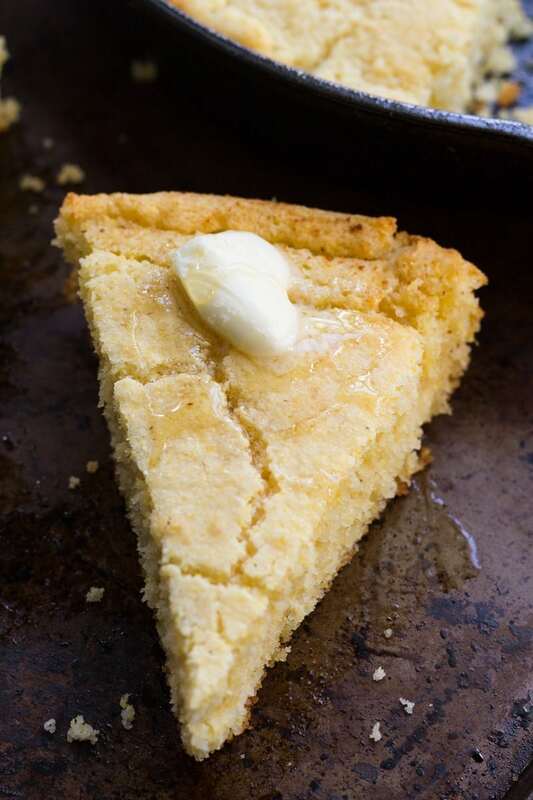 This classic Southern cast iron skillet cornbread is my mother’s recipe. You’ll love the savory buttermilk flavor and the deliciously crunchy crust! This recipe was sponsored by Acorn Media and its advertiser. All opinions are my own. Did you know that there are two kinds of cornbread? One kind is sweet, and the other is not. I like them both; in fact, I’ve even shared a recipe for the sweet kind of cornbread before. However, today’s cornbread recipe is for the savory type of cornbread. 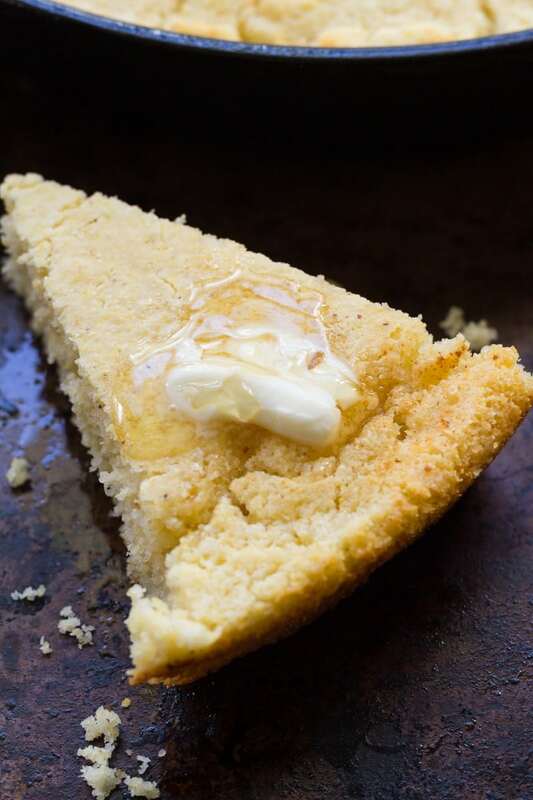 Traditionally baked in a cast iron skillet, this cornbread is hearty, rustic, and has a crunchy crust. I enjoyed cast iron skillet cornbread throughout my childhood. My mom made it pretty frequently, and I could always be relied upon to polish off several large wedges (preferably accompanied by a tall glass of cold milk). I asked her to walk me through the making of this cast iron skillet cornbread and she very kindly obliged. I’m so happy to add another family recipe to my repertoire! The calendar tells me that the season is turning from summer to fall, although—here in Florida—you wouldn’t know it yet from the unrelenting heat and sauna-like humidity. This kind of recipe makes me long for cooler weather. 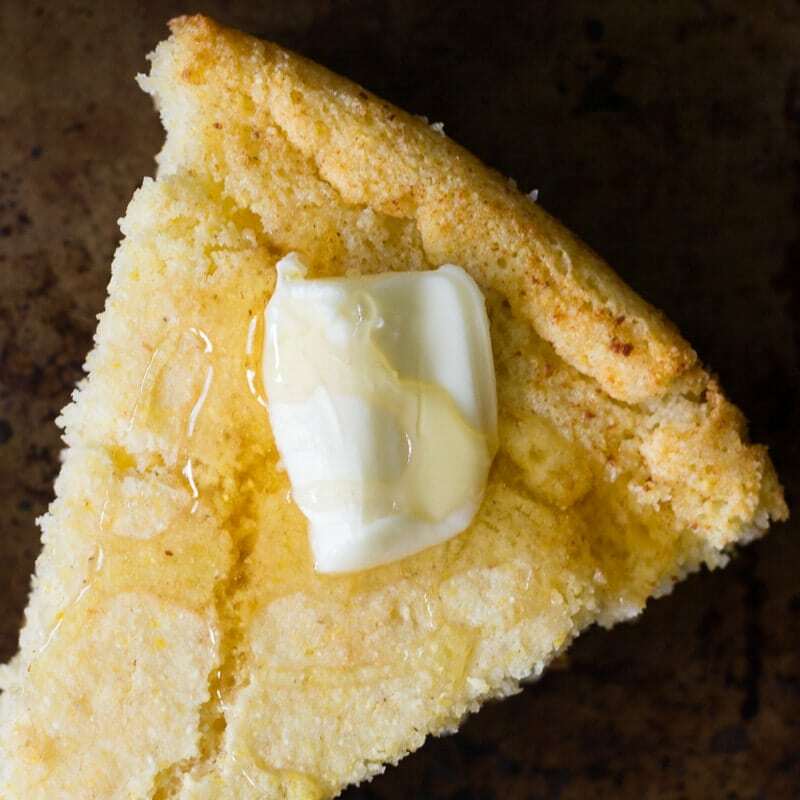 I can just imagine baking up a big skillet of cornbread and placing it on the table alongside hearty bowls of soup, wisps of steam gently spiraling upward. Soup and cornbread are a hearty combination that’s perfect for a cold evening. I picked up some Progresso Rich & Hearty Chicken & Homestyle Noodle soup from Walmart for that very purpose. You can find it in the soup aisle (see the bottom of this article for pictures of the exact location). 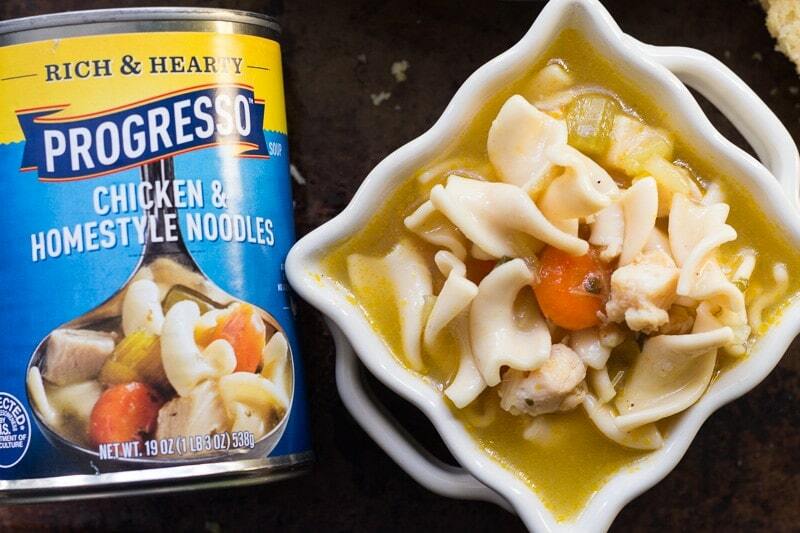 Progresso Rich & Hearty Chicken & Homestyle Noodle soup is made with antibiotic free, all white meat chicken. 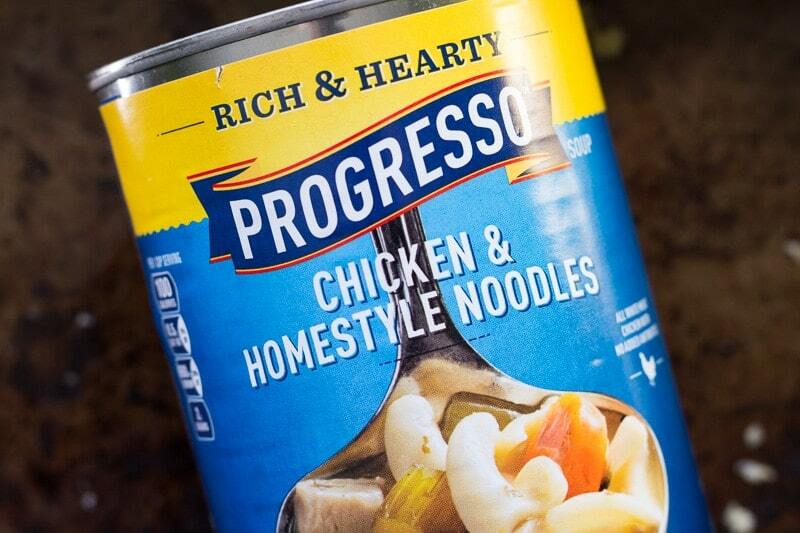 You can pick up all your favorite Progresso soups at Walmart for quick, healthy, and easy meal solutions. There’s nothing better than a real dinner, real fast—any day of the week! If you are planning to buy a new cast iron skillet before making this recipe, make sure that you “season” it before using. Cast iron skillets usually get rubbed with oil and baked empty before being used the first time; follow the manufacturer’s instructions on your skillet. This cornbread is so hearty that it doesn’t really need any butter on it, but I like to go all in and toss a pat of butter on mine anyway. Ditto for a bit of orange blossom honey if I’m feeling wild. Pair this cornbread with collard greens, stews, chilis, and more. It keeps well, so if you have leftovers, simply cool and cover airtight. You can even reheat it in the skillet the next day if you like. 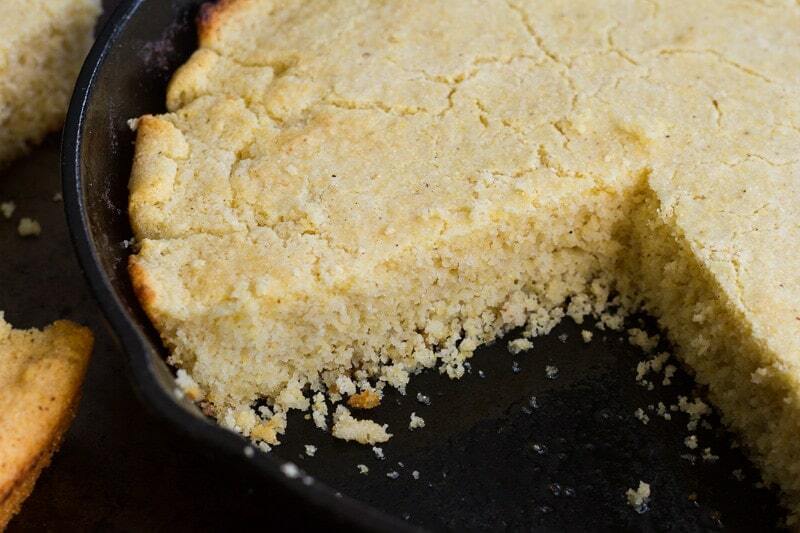 This classic Southern cast iron skillet cornbread is my mother's recipe. You'll love the savory buttermilk flavor and the deliciously crunchy crust! Place the cast iron skillet in the oven and preheat the oven to 400 F. Cut the butter into a few pieces and set aside. Combine the mix, corn meal, baking powder, and salt in a large mixing bowl and whisk to combine. In a separate bowl, whisk together the buttermilk and the egg. When the oven is preheated, remove the cast iron skillet from the oven. (Caution: it will be extremely hot!) Drop the butter into the skillet to let it melt. Pour the buttermilk/egg mixture into the dry mixture in the large mixing bowl. Whisk to combine and immediately pour the resulting batter over the melted butter in the cast iron skillet. Bake for 20 minutes, or until the edges are golden brown and a toothpick inserted in the middle comes out clean. Now I’m craving cornbread and soup. I’m so glad we finally moved into soup season! I use a cast iron skillet to make my cornbread too and will be making it and freezing it for cornbread dressing in the not too distant future. It’s time for me to stock up on my favorite Progresso soups too. 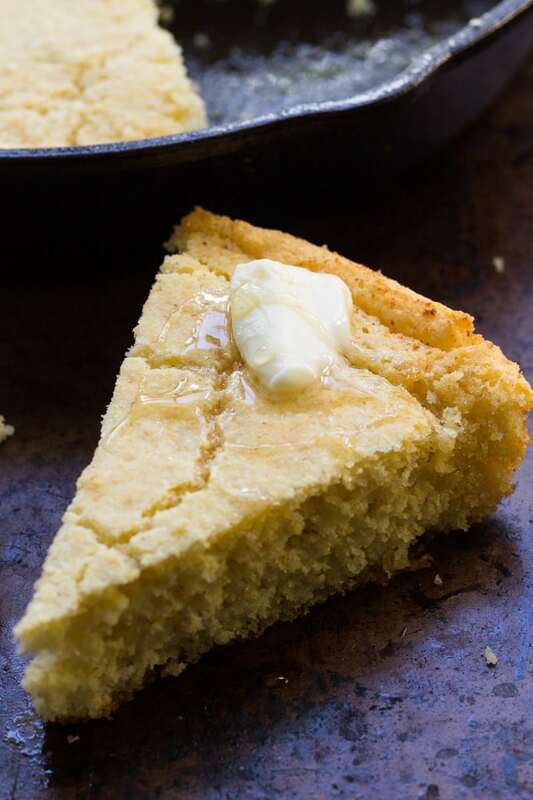 I have never tried making cornbread in a cast iron skillet before but I am going to have to try it for sure along with the recipe. Progresso soups would go perfect with this cornbread. Yummy!!! Thanks for sharing the recipe. I’ve never used a cast iron skillet. Is it wimpy of me to admit that they scare me? LOL. 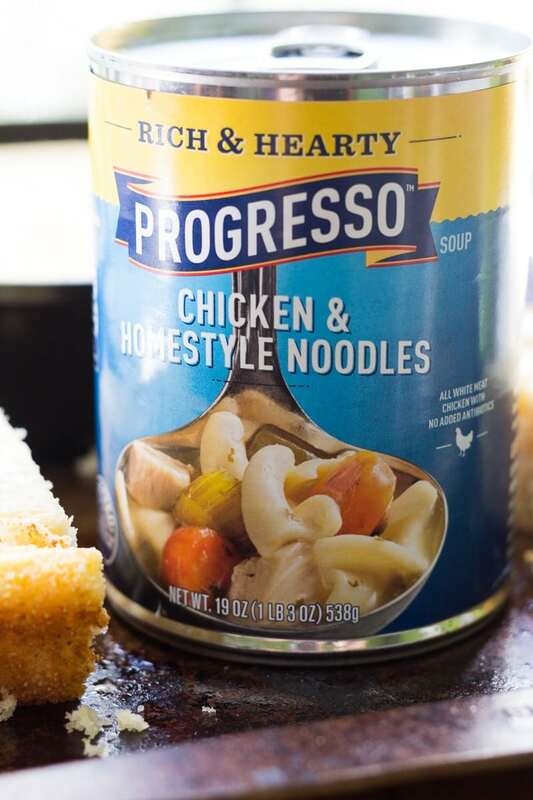 Progresso is the soup of choice in our house. Love their vegetable soup! Thanks for sharing! My mom used to make her cornbread in a cast iron skillet just like this! It was so good and we always looked forward to the days she made it! Brilliant! I’ve never used a skillet before but from what I’ve seen online it’s so versatile, i don’t know why it’s taken me so long! Now this looks tasty. I love a good cornbread recipe. It’s such a comforting side! What an easy way to make up some corn bread, appreciate you sharing this. I love Progresso soup too! 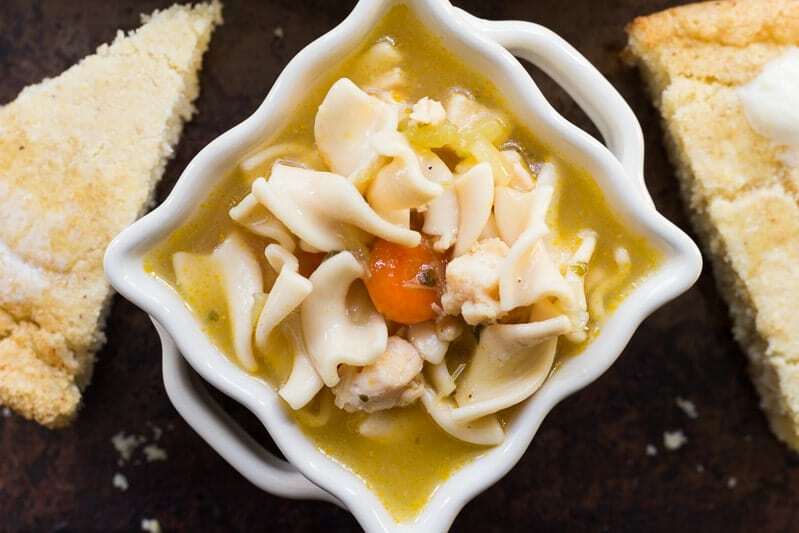 Corn bread and chicken noodle soup, now that would delicious. I have never made my own corn bread before but its so yummy! Oh my gosh! I haven’t had cornbread since I was a kid! I really want to make this. My son loves cornbread so i will try this recipe for him. I have never made it in a cast iron skillet though. Will need to try it out! This is the best way to make cornbread!! It comes out so fluffy. I love cornbread. Yummy.i have a cast iron pan. MYbe I’ll try to make it. I grew up eating cornbread, it was a staple in our home for sure. Everything tastes better in the cast iron pan. Oh Yum! This is such a wonderful recipe! I love cornbread – never tried making it in a cast iron pan! That cornbread definitely looks amazing and I’d love to keep the recipe! I really like cooking with my cast iron skillet, it’s great! Thanks for the tips on how to cook this cornbread perfectly. YUM, I love cornbread with soup. It’s perfect for the cool fall weather. Cornbread is one of the world’s most perfect foods; its perfection is only augmented by cast iron cooking and soup as a side. 🙂 Perfect!